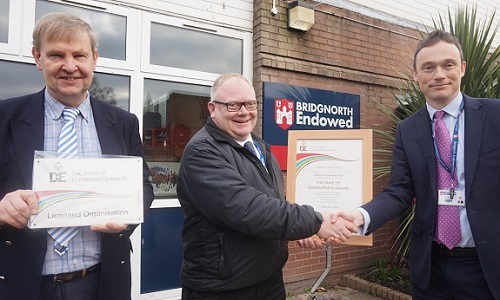 Recently approved as a Licenced Centre for The Duke of Edinburgh’s Award, Bridgnorth Endowed was awarded its official licence and plaque earlier this week. Mr Wyndham James, operations officer from the organisation’s Central England Regional Office, came into school to formally present the DofE accreditation to Mr Worth and Mr Clayton. The news reflects the school’s ongoing commitment to the scheme and, as a Directly Licenced Centre (DLC), it is now able to deliver complete DofE programmes to young people on its own premises, as well as verify the Awards. Bridgnorth Endowed has been running DofE for more than 30 years and this year sees another excellent uptake for the programme, with 30 students signing up for the Bronze Award and another 30 embarking on Silver.